This week’s post is extra special! Also a little longer than normal (bear with me)….let me explain! 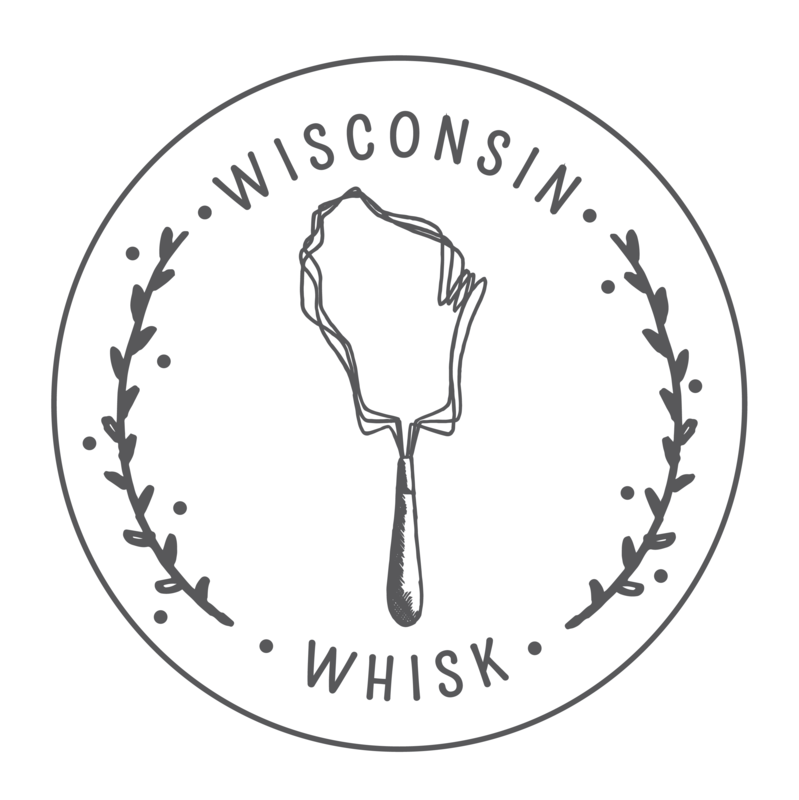 Recently I became a member of a blogging group called Wisconsin Whisk. It’s a group of food bloggers in the great state of Wisconsin. The main goal is to connect bloggers in Wisconsin together with each other as well as with local producers, sponsors, advertisers to really nuture a community of support. As of right now, there are close to 40 blogs that are members! The majority are located around the Madison, Wisconsin area but there is certainly an impressive footprint of Wisconsin covered, from Eau Claire all the way down to Milwaukee and everywhere in between. Here is a list of members. Check them out! And if YOU are a food blog located in Wisconsin, consider joining! A month or so ago, we had a first sort of ‘meet and greet’ event where some of us close to Madison got together to meet each other face to face and briefly cover what the goals of Whisk are and brainstorm ideas and discuss what members wanted to see Whisk help them accomplish. One of the things we discussed was a sort of secret santa recipe swap if you will. The idea would be that if you wanted to participate you could put your name in a virtual bucket and you would be then be assigned another blog to go and research and find a recipe of theirs you wanted to try. You would make the recipe and document and photograph in your own style. Then those participating would unveil their “secret” recipes at the same date and time! We decided to call the event, All Whisked Up! None of us know who is assigned our blog until posts are published (that’s today!). My ‘assignment’ was to check out Kristin over at Everyday Celebrations. Personally I absolutely love the positivity and gratitude that is practiced through finding the good in every day and having little celebrations all the time! Not to mention my admiration for a mom of 5 finding time to blog! 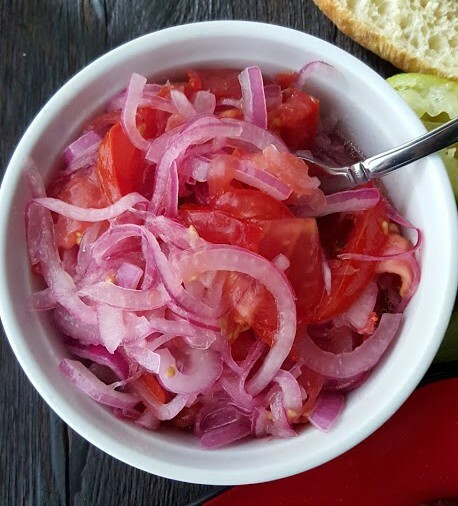 While looking through Kristin’s blog one of her posts and recipes really stood out to me. 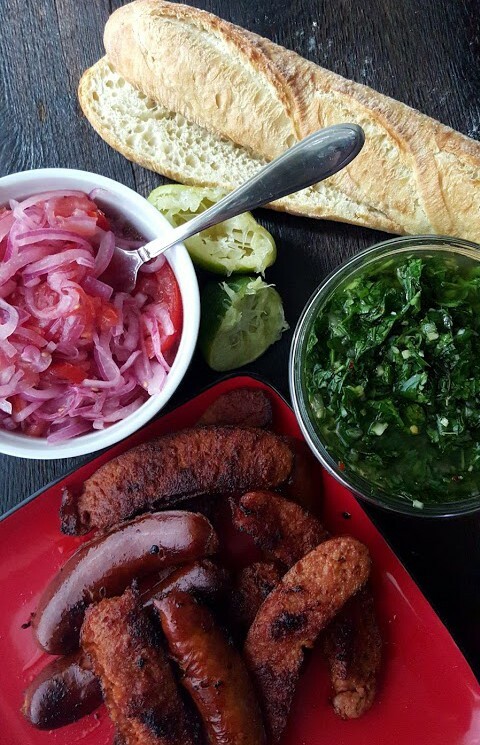 Kristin had a post highlighting when she made Choripan and I couldn’t help but try to make it myself. 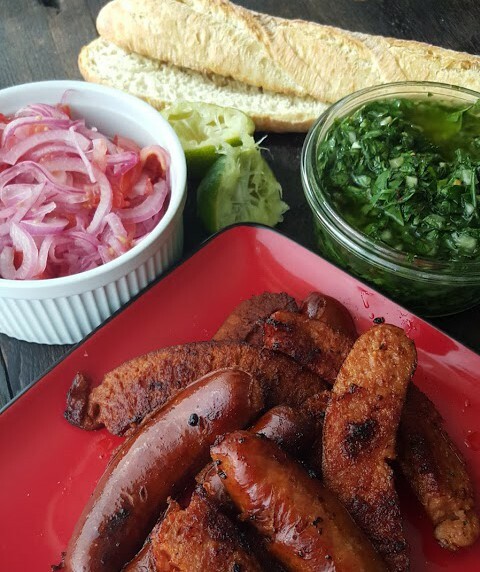 What the hellllllz is choripan you ask? Ohhhh, sit tight, you’re gonna want to pay attention. 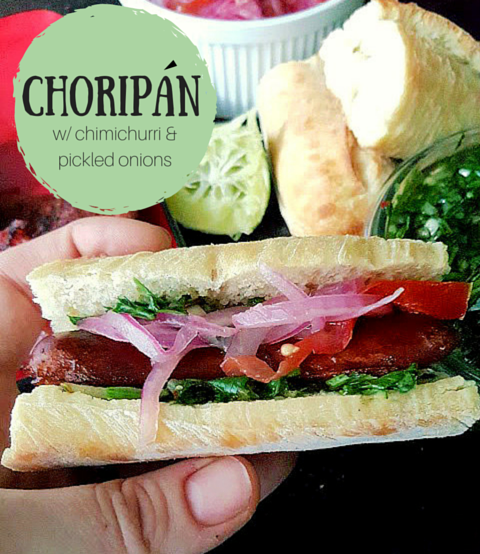 Super high level: Choripan is a type of sandwich that is incredibly popular in South America, most notably Argentina, Chile, Brazil, Guatemala, and a ton of others! 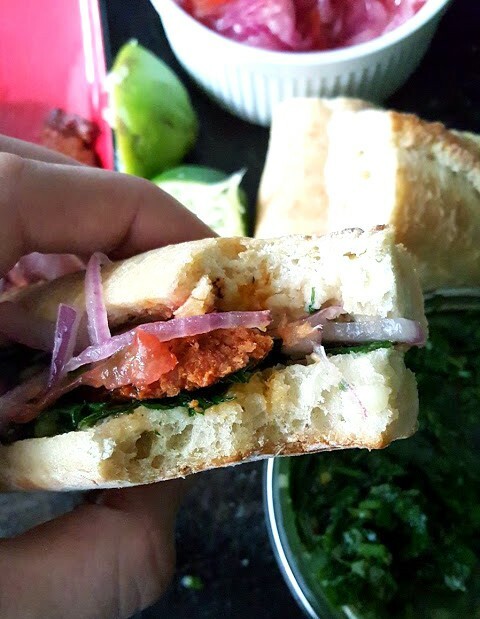 It’s name comes from a combination of it’s ingredients chorizo (chori) and bread (pan). It’s basically an fancy adult version of the american hot dog. 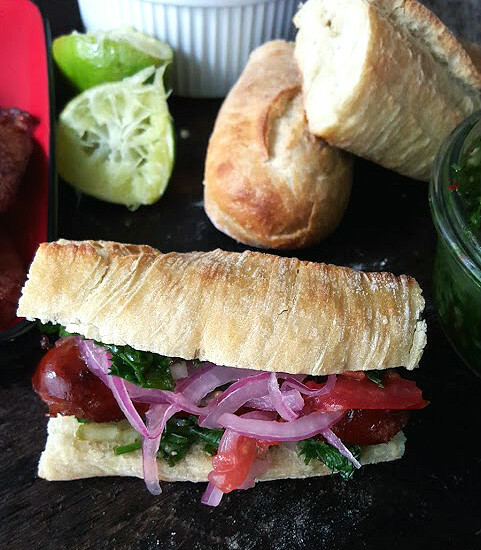 Chorizo sausage grilled to perfection, split down the middle and served on crusty bread with chimichurri and pickled onions (that’s the most popular method). 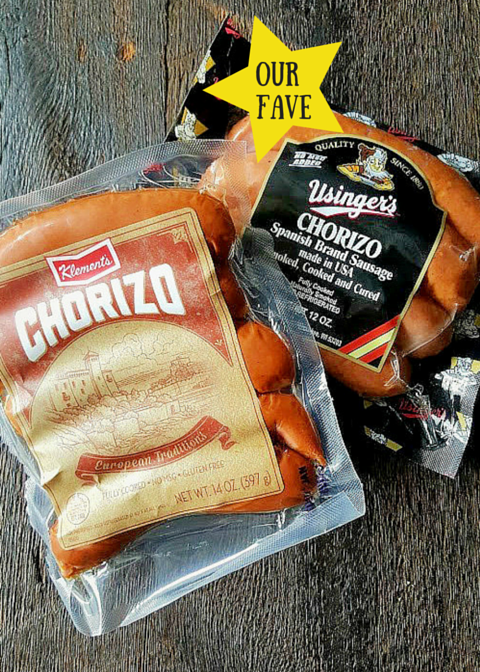 Through my research I found that while most recipes you will see call for Chorizo, not all chorizo is the same. Normally when someone says Chorizo you think of mexican chorizo which has that classic red color needs to be removed from it’s casing and ends up as ground meat. But there are many different kinds of chorizo. Spanish chorizo even has many version all depending on the locale. 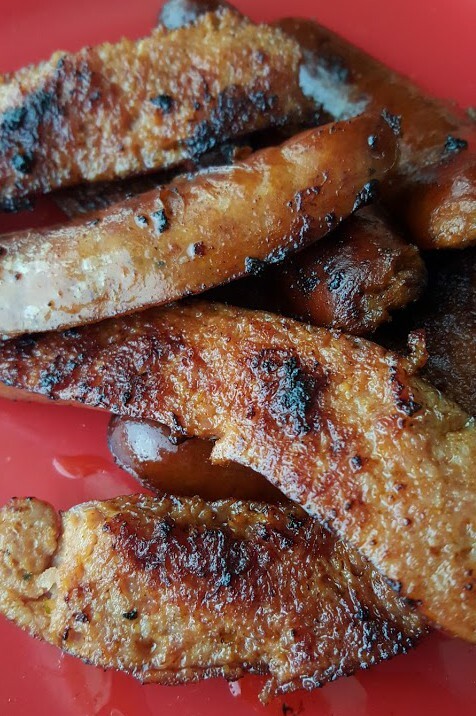 But most notably, Brazilian and Argentinian Chorizo is made with pork sausage which is very closely related to italian sausage and has similar flavors with more heat and less fennel flavors. I looked at every.single.type. of chorizo that was available at my grocery store and tried to pick the one that was like what’s described above. I decided to give two of them try for comparison. Both were actually very good but I would pick the Usingers brand over Klements. Probably just personal preference but I like the consistancy (less crumbly, more sturdy) and the taste (more robust) better than the other. Both were great and totally tasty though! 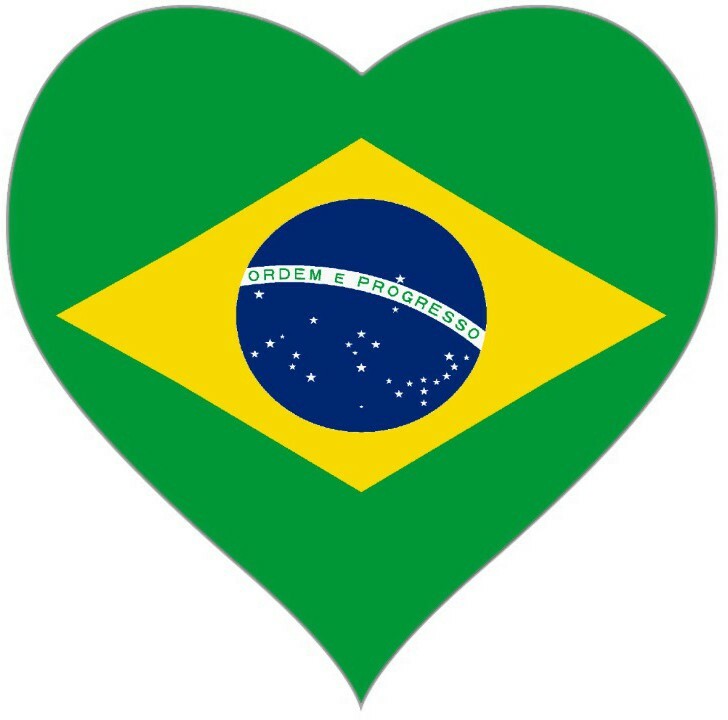 I have a special place in my heart for Brazil (Brasíl ❤ ) from my travels there when I was in high school. And actually had choripan while I was there! This brought back memories for me and the chimichurri was like a walk down memory lane for my taste buds. This post and recipe was fun to make and even more fun and delicious to eat. 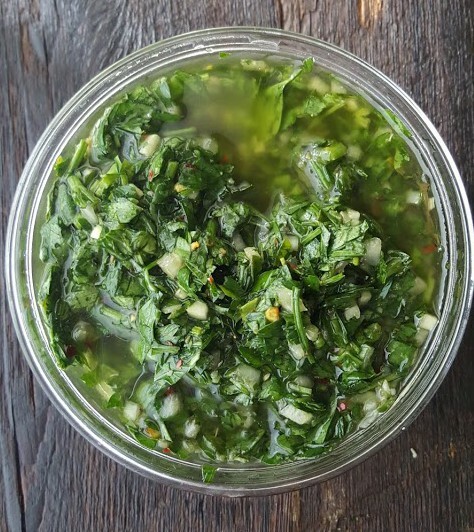 Kristin is keeping her recipe for her chimichurri on lock down 🙂 so we made our own version but stayed true to her vision. 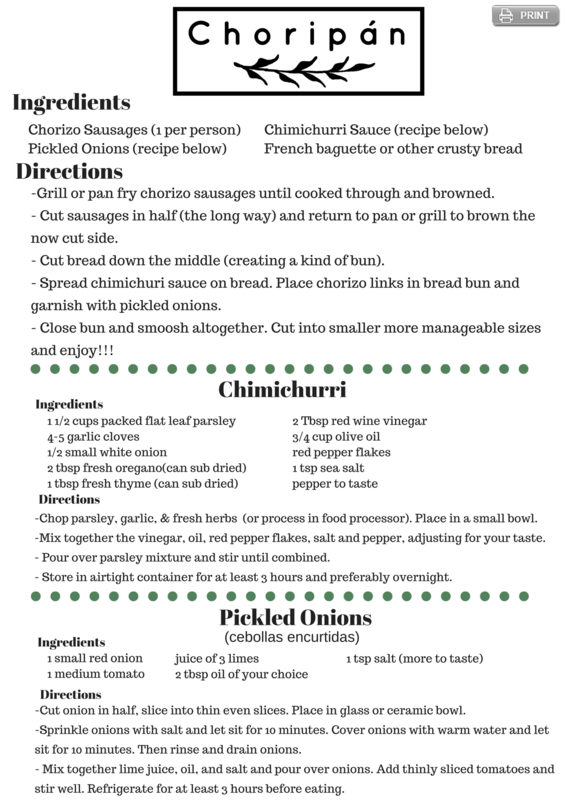 So without further adieu, here is our take on choripán! it was such a beautiful spread I couldn’t help but snap more photos! Then you put it all together! 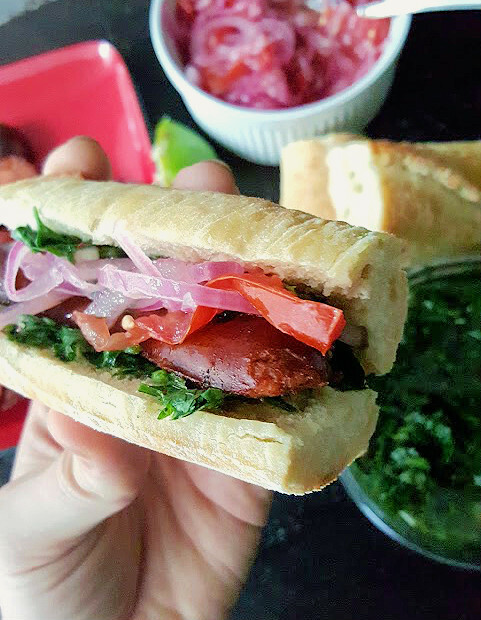 I slathered both sides of the bread with chimichurri and then placed the sausage on top, garnished with pickled onions and tomatoes and squished together. My favorite part was definitely the chimichurri. I actually used the leftovers a few days later on a baked chicken. Just stuffed some under the skin of the chicken and rubbed it down all over. It seriously tasted so good. You might will have some left over of this so experiment, have fun, and find another use! Whew! Done with pictures 🙂 This was really super delicious and Jake loved it, I loved it, so unique and flavorful. You should definitely give this recipe a try. 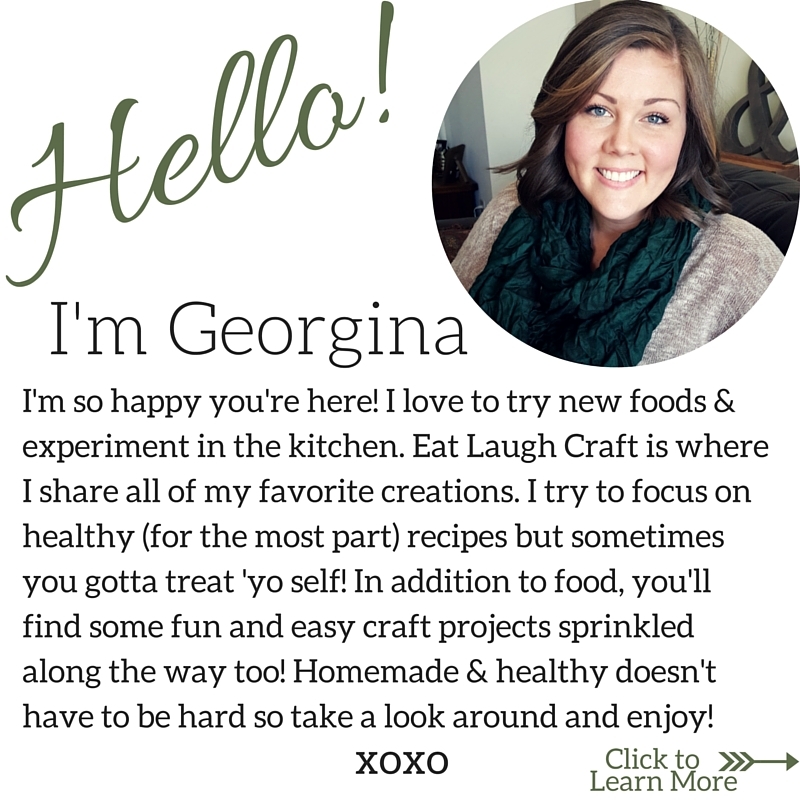 Also make sure to check out all the other blogs and member of Wisconsin Whisk! You can click on the little blue frog link down at the bottom to see all the other members who are participating in the recipe swap! *Here is the inspiration post from everydaycelebrations. *I added about 1-2 tbs of fresh chopped basil and it was sooooo delicious! In a large skillet set over medium-high heat, melt the butter until foamy. Add garlic and cook until fragrant, about 30 seconds. Remove from heat, and stir in artichoke hearts, mozzarella, cheddar, Parmesan, sour cream and shallot until combined. Slice/open your bread) Place the bread open face side up on the baking sheet, and spread the cheese and artichoke mixture overtop. Bake until cheese is melty and it starts to brown and bread is hot. I finished it off with a few minutes under the broiler to get even better color! 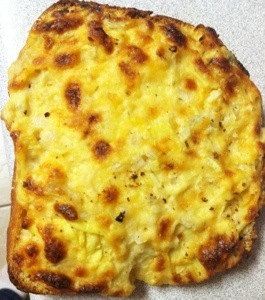 Then cut bread into servable size pieces and serve right away, while the cheese is still nice and melty and delicious. I made this for a group of friends and they all seemed to enjoy it. I defineitly did! 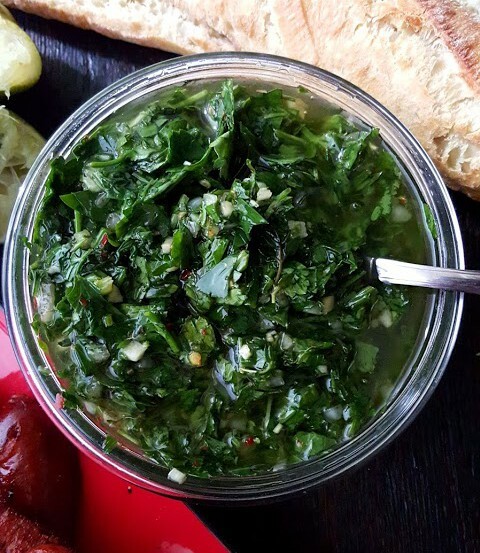 This would be great as an appitizer or side dish. Also you can totally make this ahead. I actually make the artichoke cheese mixture the day before and then just spread it on the bread and baked it and it turned out fan.tast.ic! Hi everyone! I saw something like this on Pinterest (where else right?) but bread scares me a little, so I combined/adapted several recipes to come up with this. Give it a try and let me know what you think! Place yeast, sugar and water in large bowl or food processor and mix slightly and allow mixture to become bubbly. Mix in 1 T butter, salt, and 2 cups of flour and then 1 tablespoon of the fresh chopped rosemary. Oil a separate bowl, put dough in it and cover with a towel. Let the dough rise in a warm place for 1 hour or until doubled in size. Then Punch down dough and divide in half. Spray baking pan or cookie sheet with cooking spray. Shape the dough into whatever size/shape you are going to make. 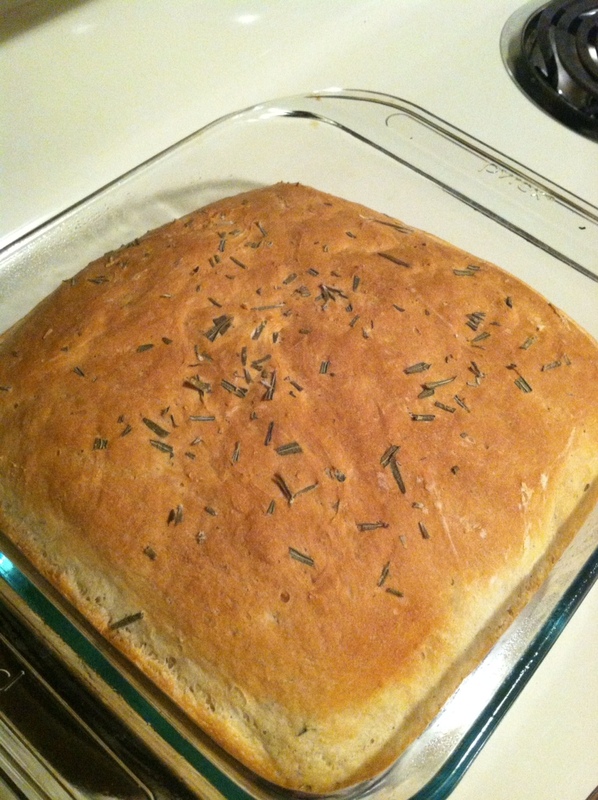 Sprinkle remaining 1 Tablespoon of rosemary over the loaves and press lightly into the surface. Let the doug rise again for about 45 minutes.